If you are looking for bathroom cabinetry in Chester County, come to us at Custom Cabinetry Unlimited! Choosing custom cabinets for your bathroom is an exciting time for homeowners. We will work with you to design custom bathroom cabinets that are made with contrasting materials and colors. Bathroom cabinetry is considered to have the greatest impact on a bathroom remodeling project. It makes sense that it would, as the cabinets are the most prominent feature in any bathroom. They affect the look and feel of the entire space. As such, it is important to choose colors and styles you know you’ll be pleased with. One of the best ways to ensure that you will enjoy the end result of your remodeling project is to choose custom cabinetry. We at Custom Cabinetry Unlimited will be more than happy to help you achieve your dream bathroom in Chester County. Our company is able to provide you with all that you need to have a successful bathroom remodeling project. If you are looking for new bathroom cabinets, bathroom vanities or bathroom sinks in Chester County, contact us to achieve the look you’ve always wanted! Before you begin a bathroom remodel, you’ll want to be aware of how you intend to use your bathroom. If you are a person who enjoys long soaking sessions in a Jacuzzi, you may want to incorporate a large linen cabinet into your bathroom cabinet plan. If you like to pamper yourself with skin creams and lotions, consider having a special cabinet designed just for these things. Custom Cabinetry Unlimited, LLC is equal to the challenge of designing custom bathroom vanities, bathroom sinks and bathroom cabinets for any design configuration. High-quality bathroom cabinets and bathroom sinks can greatly enhance the atmosphere of your bathroom. To ensure a bathroom remodel you are happy with, you will want to choose a company you can trust and who performs high-quality work. The wide variety of styles and materials available to homeowners today makes it easy to achieve the look and feel you want for your bathroom. We construct a large selection of bathroom cabinetry including stand-alone vanities, over-the-toilet units and built-in hampers. There are a wide variety of trends available for bathroom cabinet design. Some people enjoy the “furniture” look and choose cabinets with bun feet and raised panels. Richer woods such as dark cherry and walnut are used in these designs. The amount of time and attention given to a bathroom makeover can transform an ordinary bathroom into a retreat of comfort. You can achieve the relaxation of a high-end spa right in your own home. How do you vision your bathroom cabinets? We realize every homeowner’s vision for their bathroom is different and that is why we offer unlimited possibilities. Our company can add unique features and cabinet finishes to every space. For instance, contemporary design is becoming more popular as people look to reduce clutter and want better organization in their bathroom. These designs feature simple contours that create a sleek and airy space. 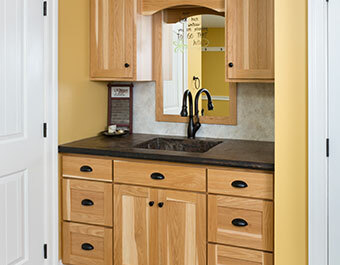 Traditional cabinetry is also a popular choice. The feel and warmth of traditional styling creates a comforting, homey feel. These designs are timeless with stunning detail and expert finishing. No matter what type of bathroom cabinetry that you’re seeking, our fine quality craftsmanship is customized for your lifestyle. Bathrooms are an important area for good storage and quality cabinetry. Let Custom Cabinetry Unlimited transform your bathroom from merely utilitarian to something elegant or tranquil. 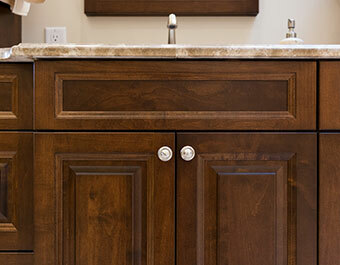 Our custom bathroom cabinets will add value to your home and give you more space to get ready each day. We design, manufacture, deliver, and install in Chester County and the surrounding locations. Contact us today to get started on your next bathroom cabinet renovation project!